From Morgan Matson, the bestselling author of Since You’ve Been Gone comes a feel good story of friendship, finding yourself, and all the joys in life that happen while you’re busy making other plans. Dad? Avoid him as much as possible, which isn’t that hard considering he’s a Congressman and he’s never around. Friends? Palmer, Bri, and Toby, pretty much the most awesome people on the planet, who needs anyone else? Until a political scandal costs Andie her summer premed internship, and lands both she and Dad back in the same house together for the first time in years. Suddenly she’s doing things that aren’t Andie at all, working as a dog walker, doing an epic scavenger hunt with her dad, and maybe, just maybe, letting the super cute Clark get closer than she expected. Palmer, Bri, and Toby tell her to embrace all the chaos, but can she really let go of her control? 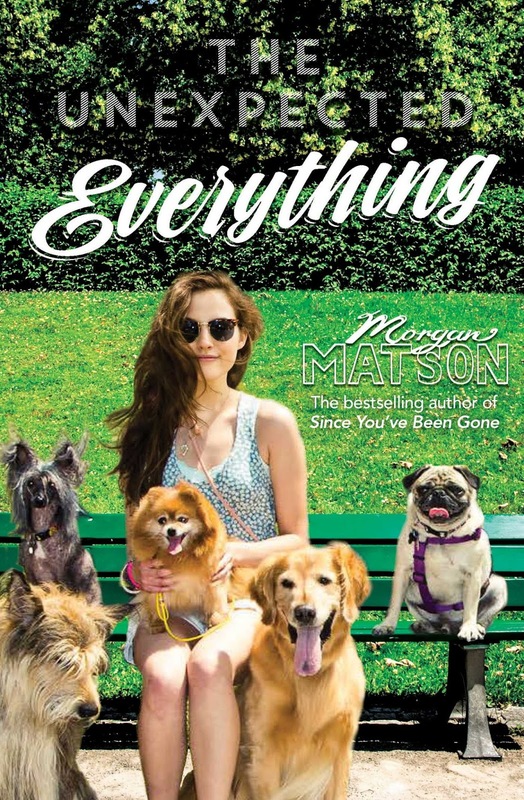 To celebrate the May first release of Morgan Matson's The Unexpected Everything in Australia, Please welcome Morgan to Diva Booknerd with her first guest post on tips for budding authors. First of all, yay! Congratulations. You have chosen a job that you can do in your pajamas, which I think many more jobs should offer you the option of doing. Who doesn’t work better when they’re comfy? My own path to being a writer was winding and circuitous and not something that I would necessarily recommend that people follow. But along the way I have learned some things, and I’m happy to share them with you now. Here are my top five writing tips. This is one of the biggest ones. I meet lots of readers on tour who want to write, but they’re discouraged because they don’t think their writing stacks up to the books they read. But the thing is – the books you get from the bookstore are not first drafts. Far, far from it. My editor and I typically do four drafts on every book. My first drafts are messy and scattered with way too many characters and subplots. Some of my friends’ first drafts are really short and spare and then they fill them in later. But they’re not the finished product. And then after you finish revising, there are copyeditors and proofreaders…whole teams of people whose whole job it is to make your book better. So don’t compare your own writing to the books you read. We have a lot of help. This is my biggest tip of all! Reading is how you learn how writing works. I wouldn’t have been able to be a writer if I hadn’t been a huge reader. Writing isn’t a magical ability some people have, where everything they write down is flawless (well maybe some people, but none I’ve met). It’s a skill! And like any skill – like drawing or riding a bike or cooking – you get better at it the more you do it. If you read your favorite author’s first book and then their fifth, chances are you’ll see a big difference. It’s something that you get better at with time, over time. What do you love? What do you have to read the day it comes out? What makes you giddy and excited and go into full on fan mode? That’s most probably what you’re going to want to be writing. I spent a lot of time in college trying to write super-serious "literary" short stories... When I was going home at night and devouring Harry Potter and the Traveling Pants books. Don’t feel like you should write a certain genre or kind of book. Write what makes you happy. Don’t worry about how to get published, get an agent, anything like that. Just have fun with it. Write the best stories you can – all the rest of it will come later. Good luck and happy writing! Morgan Matson received her MFA in Writing for Children from the New School. She was named a Publishers Weekly Flying Start author for her first book, Amy & Roger’s Epic Detour, which was also recognized as an ALA Top Ten Best Book for Young Adults. Her second book, Second Chance Summer, won the California State Book Award. She lives in Los Angeles. Great post! It's so true that you can't worry about your writing because it WILL go through many drafts and edits. I wish a friend of mine would remember this more often. She wants to write and she has GREAT ideas, but she often gets discourage and doesn't think she's good enough. You just have to keep at it! Oh, I'm sorry to hear that Lauren. It sounds as though she just needs a bit of a confidence boost and to believe in her abilities. I believe there's a writer inside all of us if we look hard enough. I love this. So many great answers. I think too many young writers are too worried about not getting it right. Generally for most authors.... they don't get it right the first time or second time or so on. There are first drafts and second drafts and editors for a reason. And yes write what you know and what you love and have fun with it. Wonderfully said Jenn. I think that's probably the key, to be creative and just have fun. Write and not yo worry about correcting spelling mistakes or sentences that need polishing. I don't think I'd be cut out for writing. I have no doubts that I could, but whether it would be any good is another story. I'm probably too highly strung. You need to show me some of your work one day Kei, you've been teasing me for what feels like years now. Eeeh fantastic post, thank you girls! It's really encouraging to hear that first drafts don't have to be perfect. It's something I constantly stress over. I go through about 3-4 re-writes of each chapters before I'll even CONTINUE onto the next one. I could never write for that particular reason probably. I'm really hard on myself and would need to get it right the first time, I couldn't imagine having an editor wanting to.make changes even. I didn't know you we're writing Britt, how exciting! Is this for Nanowrimo? I'm sure I've got that wrong. I love this interview Kelly, it sounds so inspirational for budding writers and it's definitely true - first drafts always need polishing and are never perfect from the get go. Hopefully this one inspires others, great tips Morgan! I'm actually reading my first Morgan Matson book at the moment and it's so incredibly lovely. She's an inspiration to budding authors to get out there and have a go. I love that! I couldn't agree more! I think we see authors are being at the forefront and readers tend to forget how many people are behind that author from editors, to publicists to even cover designers and loved ones who support them. What makes you giddy and excited and go into full on fan mode? Honestly? Tragic heroes/villains - they are my weakness. Villains are my weakness too Claudia. They always seem much more interesting than the hero, especially if they're redeemable as well. While I don’t have any inclinations to write books, I find this post very interesting. It’s very positive and inspirational. Thanks for sharing, Morgan! I think your points Practice makes perfect, Pay attention to what you pay attention to and Have fun with it can be applied to any field. Love this and her tips, especially reading!